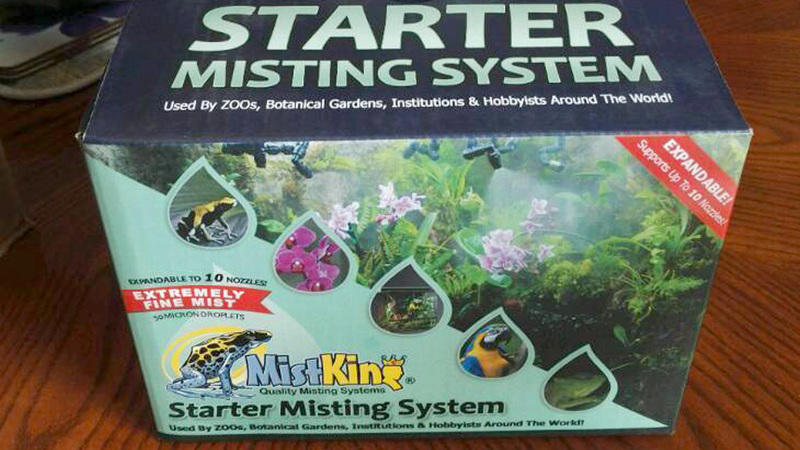 Misting systems are used to maintain and increase the humidity levels in a terrarium. These systems range from fairly simple to sophisticated set-ups. Automatic misters have become increasingly popular in recent years. But which of these products is the best and which ones should you avoid all-together? 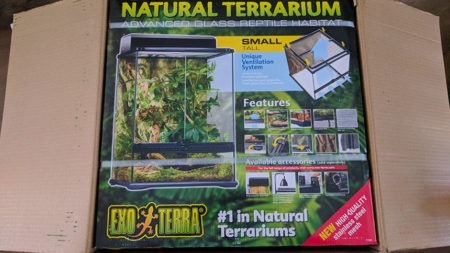 That’s what this post aims to display; the best terrarium misting systems. 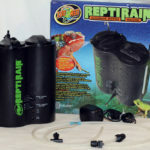 As a reptile or amphibian keeper, the misting system you plan to purchase will largely depend on your set-up, environmental needs of your pet, and your budget. It is important to note that misting systems use a fair amount of water so a drainage layer is definitely recommended. 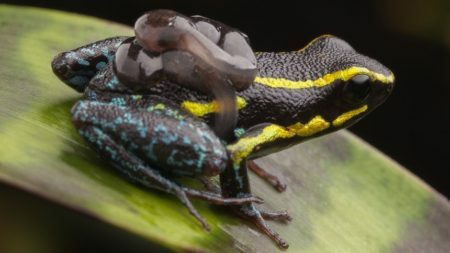 The last thing you want is a soggy substrate causing problems for your frog. Generally, misting systems come in two varieties; low or high pressure. The low-pressure mister is less than 100 pounds per square inch while the high-pressure mister is more. When it comes to misters, the higher the pressure, the better. Low-pressure mister systems are generally less efficient for terrariums. The water droplets produced by a mister also determines its suitability for your terrarium. Droplet size of about 5 microns can create a light fog while that of 20 microns creates a dense fog. 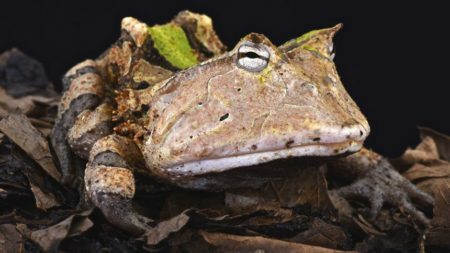 A droplet size of 100 microns or less is ideal because it is sufficient enough to increase humidity while leaving a nice coat of moisture on leaves and other smooth surfaces, which is a great source of drinking water for reptiles and amphibians alike. I’ve taken the liberty of reviewing the best automatic misting systems available. 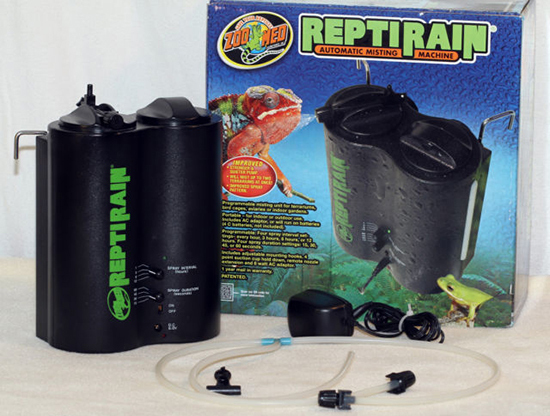 Keep in mind, with many products in the reptile and amphibian trade, there is more than one version. For example, a mister might have an entry level, intermediate, and advanced option. Or perhaps a “solo” or “multi” in the case of the exo terra product mentioned below. I didn’t take this into account. Rather, these reviews are based on overall quality of the brand’s mister, regardless of the version. So without further delay, let’s jump into it. This automatic misting system is arguably the best on the market. It adequately provides precipitation and humidity control for a variety of habitats. Suffice to say, a MistKing is one of the best things you can put in your terrarium. The system features a timer and can work with as many as 10 nozzles and they come with a check-valve to reduce dripping after misting has stopped. Also, it comes with an impressive 24v DC pump that is highly reliable and can even run dry. If you cherish your silence, then worry not, as it keeps the noise down to a very minimal level. 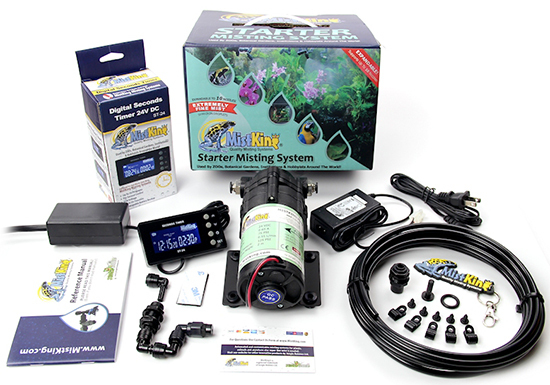 The Mistking starter system also gives you the option of customizing it to run at certain times of the day, so you can be sure that your amphibians are going to be taken care of, even when you’re out of the house. It’s important to note, MistKing has more than one kit. I’ve mentioned the starter kit for this review because it provides everything you need to get started and it’s their cheapest option. However, if you require a more advanced setup, I recommend checking their advanced misting system v4.0. 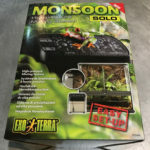 The Exo terra monsoon misting system is also another good choice and is worth a well-deserved mention on this list. 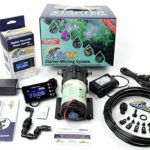 This misting system is programmable and is easy to install. It also features a relatively large 2-gallon reservoir that is also quite easy to refill. Exo terra has several versions of the Monsoon; the solo, multi, and I believe a version called the RS400. The Exo Terra Monsoon ‘multi’ features 2 nozzles but can be adjusted to accommodate up to 8 nozzles. Spray duration can be set anywhere from 2 seconds to 2 minutes and its certainly going to do justice to your terrarium. Although, this particular misting system may suffer from a rare pump failure from time to time. Overall, it will do a great job in keeping your amphibians comfortable as it mists their enclosure at the programmed intervals. 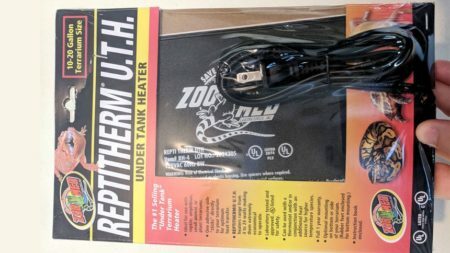 The last misting system on my list is the Zoo Med Repti Rain Automatic Terrarium Mister which is quite affordable and a great choice if you have a very limited budget. This misting system is suitable for a wide range of enclosures and can even work on 4C batteries if you do not have your AC adapter handy. It features four distinct default programmable modes which can be set to spray at intervals of 3, 6 and 12 hours and the spray duration can last for either 15, 30, 45 or 60 seconds. 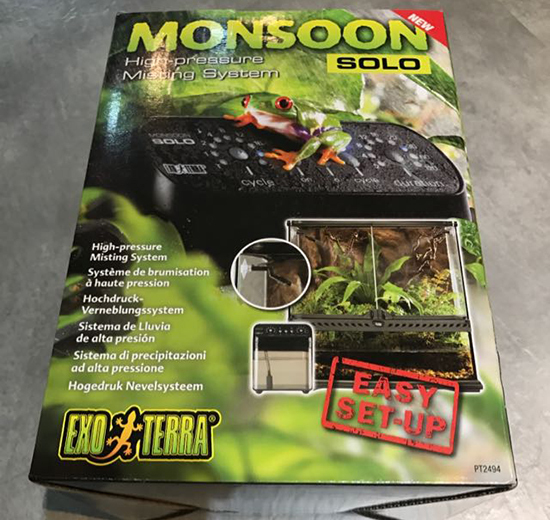 While this misting system will provide fairly adequate humidity for your frogs, it is also noteworthy to mention that it is susceptible to leaks from the nozzles and its spray function is not entirely reliable as they tend to not work on some occasions. But overall, they are a great value for money. Perhaps the most interesting aspect of this system is the mounting options. Not only does it come with latches, seen in the picture above, but there are suction cups on the back as well. If you wish, you can stick the whole system to the side of your glass terrarium. Generally, automated misters are the choice options of manual misters. It takes the work out of manually misting yourself. And peace-of-mind is great motivation, especially if you’re forgetful or often find yourself out of the house when your terrarium is in need of a humidity spike. Also, you should be mindful of the water you’re using. Tap water is not recommended as it tends to contain chemicals that can harm your pets. Not only that but tap-water high in calcium can quickly damage the misting system. 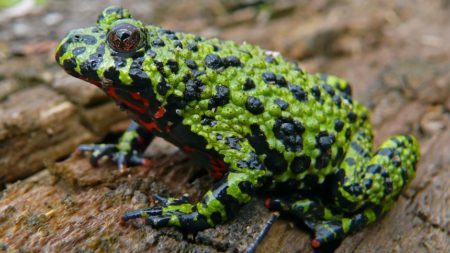 Most frog keepers are well aware of the effects of minerals in tap-water; normal levels of natural minerals aren’t a bad thing. But calcium build-up is likely the quickest way to ruin your fancy misting contraption. 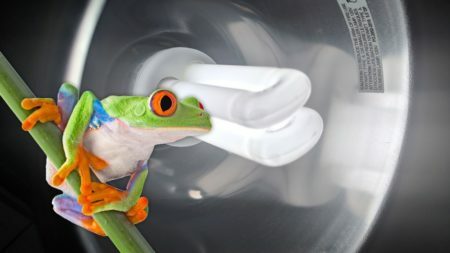 While distilled water shouldn’t be a frog’s main source of water, it’s perfectly safe to use it in misting or fogging systems. Last but certainly not least; be safe. 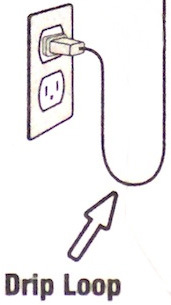 To minimize the risks of electric shock, it’s vital to connect the pump and timer to GFI outlets, avoid placing the mister near power strips or outlets and always create a drip-loop! You should also monitor your mister regularly during use to ensure that it’s not directed towards any electrical appliance.